According to the ancient religion of Shinto, Susano-O no Mikoto, the Brave-Swift-Impetuous-Male, is the god of the storms and of the sea. He is a Kami with a highly volatile temper, who is very often impulsive, but yet he also has a kind and generous side. In the religion of Shinto, Kami may have multifaceted personalities. Susano-O is a prime example. The Kami's four spirits or "tama" cause him to behave in many different ways. Susano-O's Ara-mi-tama (Rough Spirit) is very evident in the story of his birth and in his dealings with his sister, Amaterasu Omikami. Both Susano-O and Amaterasu are the offspring of the creators of the earth, Izanagi and Izanami. Susano-O came into being as Izanagi, the Male Who Invites, was purifying himself by cleansing away the impurities that he had acquired in the process of attempting to reclaim Izanami, the Female Who Invites, from the underworld. Susano-O was born as his father was washing his August nose. As soon as Susano-O came into existence, he immediately began wailing and lamenting for his mother. This wailing and lamenting already expressed the Kami's stormy character. His father tried to calm him, but his wails eventually became too much for everyone around to bear, so he was banished to the netherworld. It is said that at this point, Susano-O got so excited over his accomplishment that he lost all control. He completely destroyed all of the rice fields and irrigation ditches of heaven, and defiled one of Amaterasu's temples with his excrement. He then threw a flayed horse into a house belonging to Amaterasu where some women were weaving. (In one version of this story, one of the women was so distraught that she accidentally killed herself with her shuttle.) Amaterasu became very afraid when she saw all of her brother's reckless actions. She decided to hide herself in a cave and block it with a large rock. This action on her part plunged all of the heavens and the world into complete darkness, from which the other Kami only recovered by dint of clever stratagems and a measure of good luck. Susano-O was punished for all of the mischief he had caused by having his hair cut off and his fingernails pulled. He was then immediately banished from heaven. The old man replied, "I am the Earth Spirit and my name is Foot-Stroking Elder. My wife's name is Hand-Stroking Elder. And this, our daughter's name is Mistress Head Comb." 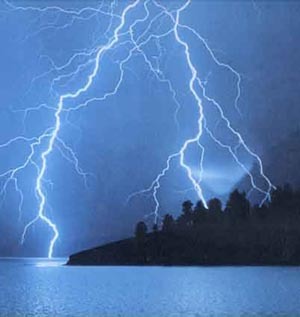 The Brave-Swift Impetuous Male asked: "And what is the cause of the weeping?" The old man said: "We had eight daughters once. But there is an eight-forked serpent that comes each year and eats one. His time has come round again. That is why we weep." The expelled Heaven Spirit asked: "And what is that serpent's form?" "The eyes are as red as the winter cherry. It has one body with eight heads and tails. On that body moss grows, and conifers; the length extends over eight valleys and eight hills, and if one looks at the belly, it is constantly bloody and inflamed." "This being your daughter, will you give her to me?" asked his Brave-Swift Impetuous Male Augustness. The old man replied: "With reverence; however, I do not know your name." "I am the elder brother of the Heaven Shining Spirit [Amaterasu], who am descended here from heaven." "That being so, with reverence, she is yours." (Campbell 471-72). At this point, Susano-O took the girl, changed her into a close-toothed comb, and put her in his hair for safekeeping. He then asked the old couple to distill a brew of eightfold refined liquor and to build a fence. In that fence they were to put eight gates, and at each gate there were to be eight platforms, and at each platform there was to be a vat holding some of the refined liquor. When all of this was accomplished, everyone sat back to await the arrival of the Orochi Dragon. After the battle, Susano-O found (some sources say in one of the monster's tails, others in its belly) a magnificent sword endowed with supernatural powers, Kusanagi-no-Tsurugi (the "Grasscutter"). On obtaining this divine weapon, Susano-O presented it to his sister, Amaterasu, as a gesture of atonement and respect. The sword was later passed on to Amaterasu's royal grandson, Ninigi no Mikoto, the legendary founder of Japan's imperial line. The divine weapon is now enshrined at Atsuta. Some sources say, however, that the original Sword Kusanagi was lost at the famous naval battle of Dan-no-ura in 1186, when the entire fleet of the Taira clan was destroyed by the Minamoto clan. The whole royal family, with all their possessions, perished at sea (see the epic Tale of the Heike). The Minamoto clan, on the other hand, claimed that the lost sword was only a false copy anyway, and that the original was preserved. 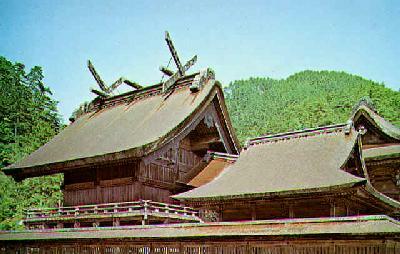 In any case, Susano-O built for himself and his new wife a palace in the land of Izumo. He appointed Foot-Stroking Elder to be his head steward and immediately proceeded to beget children. Comment: I believe that the preceding story shows that Susano-O could sometimes have a kind and loving personality. It also shows that he had the power of transforming. 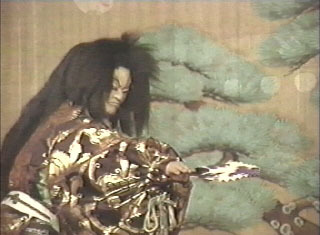 He was able to transform his bride-to-be, Princess Kusinada, into a comb and hide her in his hair. Susano-O is multifaceted. That is probably why I find him to be such a fascinating character. There are many that might compare his descent to earth with that of the biblical devil, Satan, but I do not agree. I find that the stories that show his supposed "rough personality" really reveal him to have very humanistic qualities. For example, when Susano-O had dealings with his sister, he treated her as many brothers would treat their younger siblings. He loved her so much that when he found out he was to leave heaven, he immediately went to her to make his farewells, but as a typical brother, he could not help but to tease her. Viewing Susano-O as a teasing, godly, older brother, what is so odd about throwing a dead horse around, or destroying a few crops? It is arguable that Amaterasu's reaction of hiding in the cave represents a petulant younger sister's irritation at her brother for picking on her. Most scholars believe, however, that this myth was used to describe the occurrence of solar eclipses. Amaterasu's entering of the cave would have symbolized the blocking of the sun's light, and her emergence would represent the sun's reappearance shortly after her return. Overall, I find Susano-O to be a kind and giving god. Another tale that shows his caring nature involves repaying kindness that he received from a very poor man. In return for his kindness, Susano-O told him how to prevent his home from ever being plundered by the Plague God. The method was simple: The man was to hang a plaited straw rope across the entrance of his house. That is how the custom of preventing spreads of epidemics by hanging straw ropes (shimenawa) along roads came to be tradition. Further evidence illustrating Susano-O's general good nature involves one of his sons, O-Kuni Nushi, and O-Kuni-Nushi's half-sister, Suseri-hime. O-Kuni-Nushi wanted to marry Suseri-hime. Susano-O said he would consent to this only if O-Kuni Nushi could show himself to be worthy. He needed to pass various ordeals in order to prove himself. His father first put him into a room full of snakes where he was to sleep that night. His sister, Suseri-hime had given him a magic scarf that kept him safe. He was then put through a similar ordeal with wasps and hornets. Suseri-hime gave him a scarf to protect himself in this instance also. He was then asked by his father to retrieve a certain object from a field. When he had gone quite a distance into the field, his father set it on fire. However, since O-Kuni-Nushi was a friend to the animals, a field mouse showed him an underground room where he could hide until the fire subsided. After these numerous ordeals, he had finally won his father's trust. When his father fell asleep, O-Kuni-Nushi tied Susano-O's hair to the rafters in Susano-O's home. He then grabbed his father's sword, bow and arrows, and his koto (a type of stringed musical instrument). O-Kuni-Nushi fled with Suseri-hime. When Susano-O awoke, he was unable to chase them immediately because his hair was tied to the beams of his house. After much tugging and pulling, he tore the beams down and went after them. He was able to follow them because of the sounds issuing from his koto. When he came within earshot of the pair, instead of being angry, he was impressed by their cunning, and not only allowed the marriage, but permitted them to keep the treasures they had stolen. He also gave O-Kuni-Nushi the right to rule the province. Comment: The ordeals that Susano-O put O-Kuni-Nushi through in the above story may sound harsh, but I believe that the storm god realized that his daughter, Suseri-hime had magical scarves that could protect O-Kuni-Nushi. Susano-O gave O-Kuni-Nushi these tests knowing that if Suseri-hime really cared for him, she would protect him with her magic scarves. Also, Susano-O must have been aware that his son was a friend to the animals. Therefore, he would have known that O-Kuni-Nushi was really in no danger in the field that he lit on fire. Basically, he gave his son tests that he knew he could not fail. Also, he allowed his children's marriage, and did not punish them for taking some of his prized treasures. In fact, he rewarded them! These do not sound like the acts of a god that is mean-spirited or malicious. It is important for Western readers not to misunderstand this Kami. I did not find anything in the stories I read concerning Susano-O that showed him to be essentially bad. On the contrary, he is recognized as a courageous deity who helps in the struggle against evil (such as conquering the Orochi Dragon) and who graciously subordinates himself to the supreme Kami of heaven. This is why he is worshiped together with his son, O-Kuni-Nushi, at the Izumo Shrine (see above photo; click on picture for another photo). As far as I am concerned, Susano-O is one of the most personable and fascinating of the Shinto gods. He does have a temper, and he can be impetuous, but he always means well. Campbell, Joseph, The Masks of God: Oriental Mythology. New York: Viking Penguin, 1962. Guirand, Felix, Ed. New Larousse Encyclopedia of Mythology. Prometheus Press, 1972. Malm, William P.; Brown , Sidney D.; and Enrico, Eugene. Shinto Festival Music [Videorecording]. Norman, Okla. : University of Oklahoma, Center for Music Televison, c1993. Nihongi (Chronicles of Japan from the Earliest Times to A.D. 697). Translated by W.G. Aston. London: George Allen & Unwin, 1956. Tsunoda, Ryusaku; de Bary, William Theodore; and Keene, Donald, Eds. Sources of Japanese Tradition. New York: Columbia University Press, 1958.